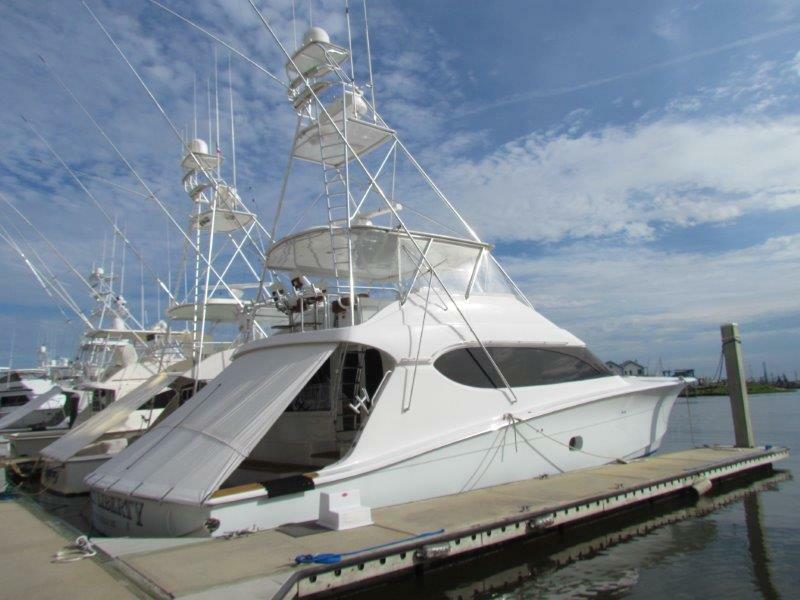 This 2005 68 Hatteras is new to the market and features Caterpillar C-32A engines with warranty until September 2019. Engines have low hours (500) since a major overhaul. 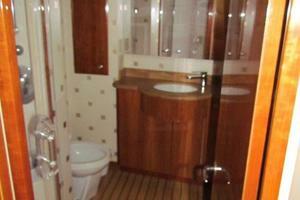 This is the popular four stateroom four head boat. Many recent upgrades!! 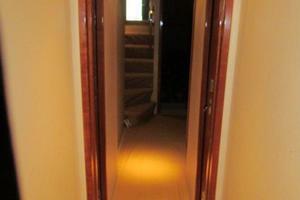 See full listing for more information or give me a call. 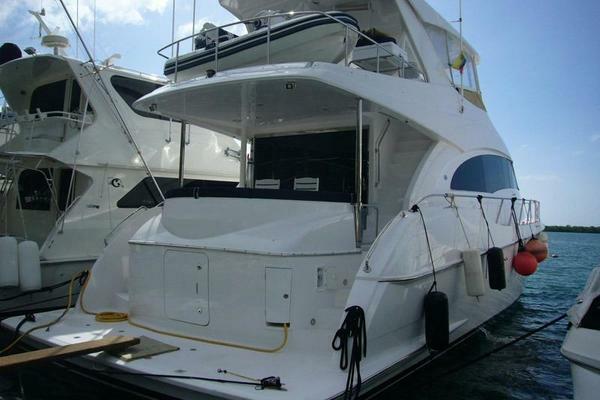 United Yacht Sales New Jersey would love to guide you through a personal showing of this 68' Hatteras Convertible 2005. 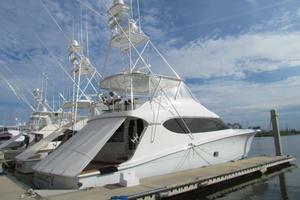 This yacht for sale is located in Biloxi, Mississippi and priced at $1,495,000. For a showing please contact us by filling out the form on this page and we will get back to you shortly! 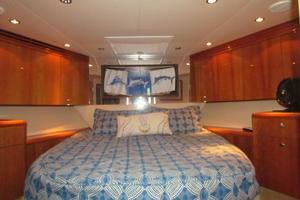 The Hatteras 68 Convertible is versatile with fishing amenities, long range capability and large interior volume. 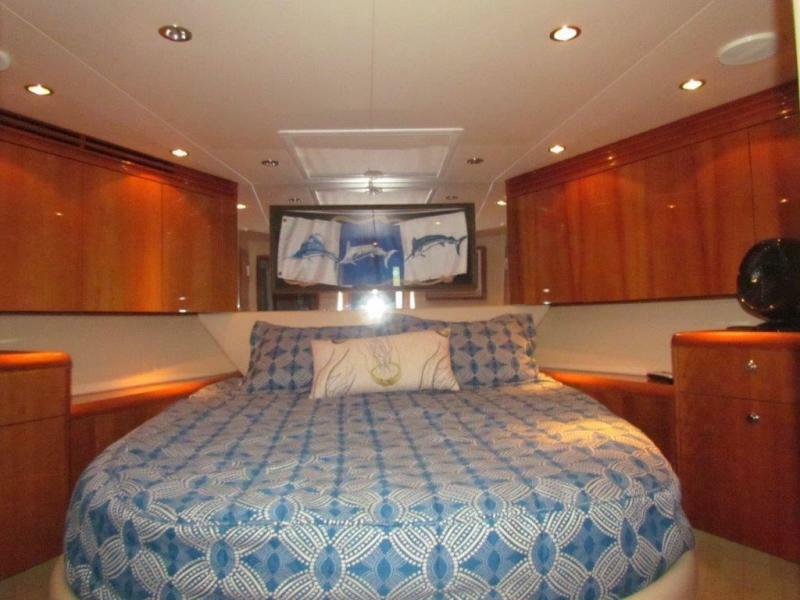 The 68 has a 21'6" beam, the widest among production competitors in its class. From the salon to the galley to the full-beam master suite, this beam provides each living area with more usable living and storage space than you can imagine. 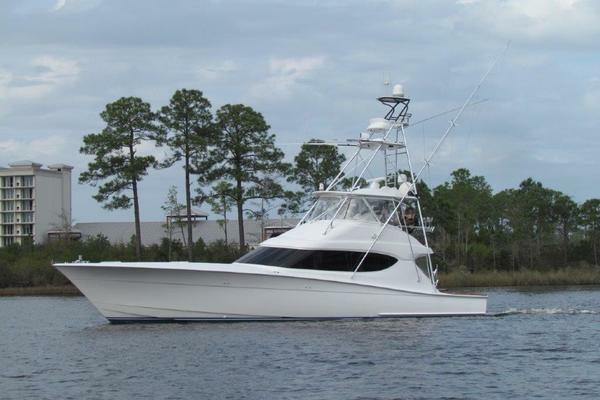 Built on a solid fiberglass, convex hull with deep propeller tunnels, the 68 offers rugged offshore performance, access to shallow ports and the ability to navigate between the two in comfort and style. 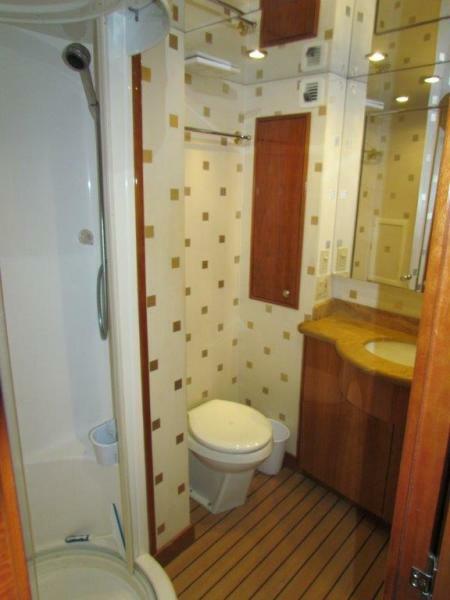 This boat showcases a four stateroom, with full center tower, built by Pipewelders. 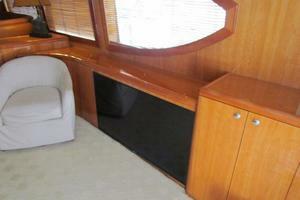 This particular boat features High Gloss Cherry interior wood with raised panel cabinetry. Inside the pneumatic sliding door, the 21'6" beam provides for an expansive salon. A U-shaped sofa to port with storage underneath provides plenty of seating and storage. 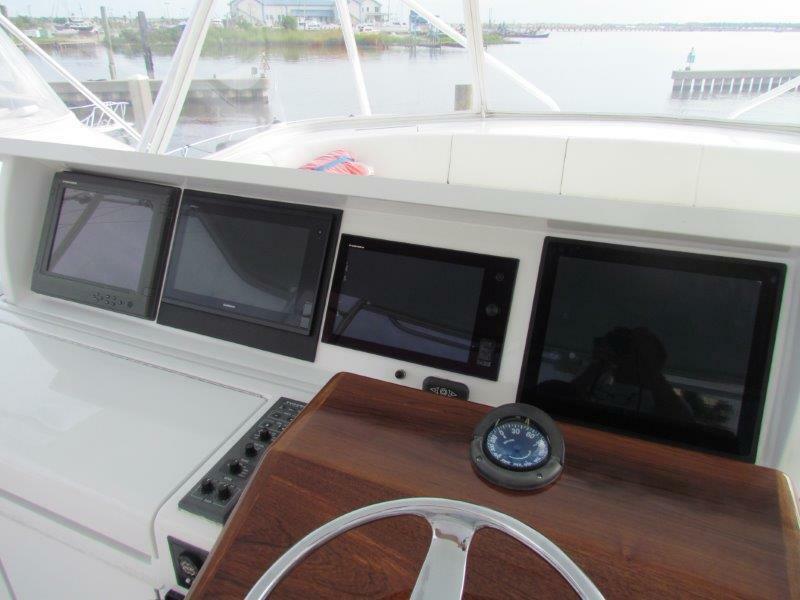 To starboard, a 50" smart TV (New 2017) is neatly tucked into the bulkhead and is tied into the surround sound system. 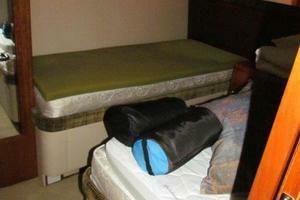 Additionalseating is provided by a barrel chair just forward of the TV, positioned to see the baits. 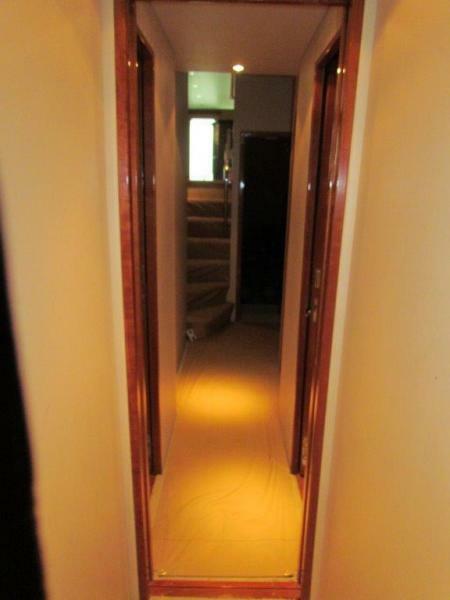 To provide additional protection, a full carpet runner covers the entire salon as well as the sofa and the custom built table. 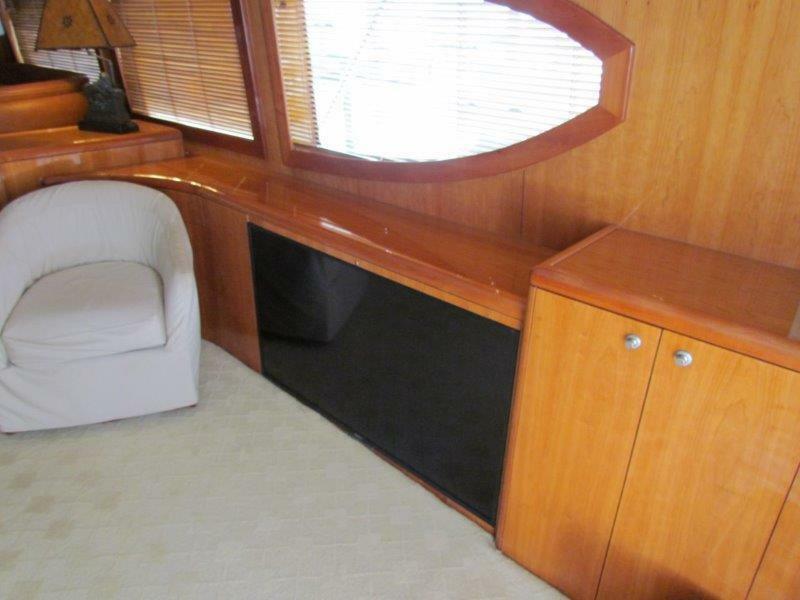 One step up from the galley you'll find several deep storage drawers and surplus pantry just forward of both the dinette and galley. 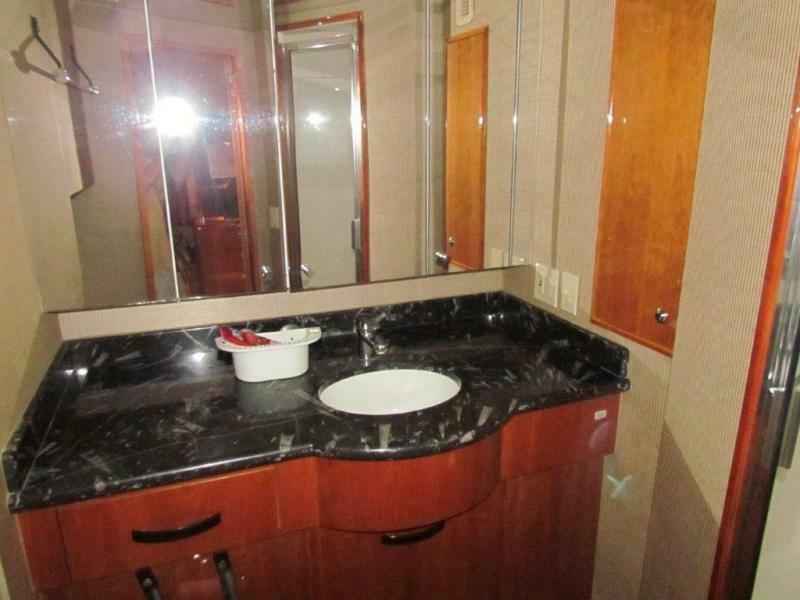 There are three under counter sub-zero refrigerator drawers and one freezer unit, granite galley counter tops and backsplashes, microwave convection oven, four burner ceramic cooktop and to port a large u-shaped dinette, all highlighted with gloss cherry panel cabinetry. 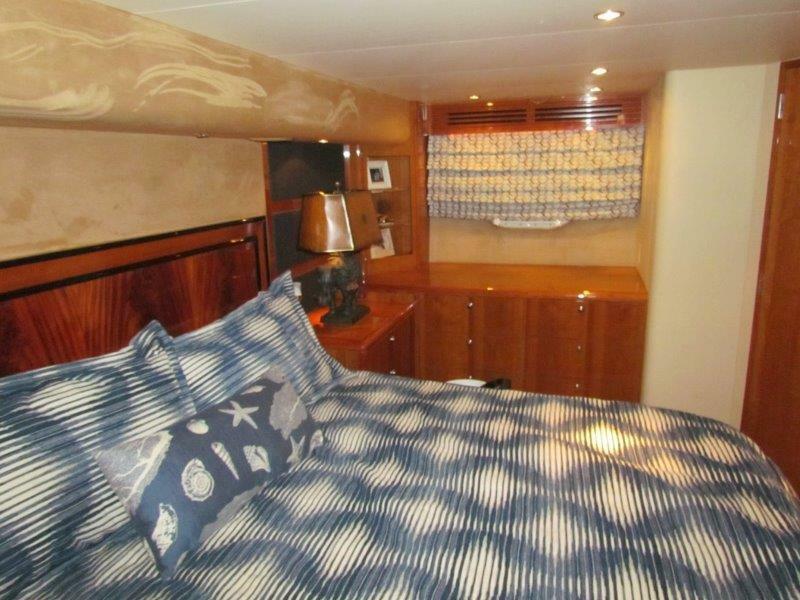 The four stateroom, three head layout includes a spacious full-beam master stateroom amidship with king-sized berth, twin nightstands, dressers port and starboard, and a walk-in cedar lined hanging locker. A custom built desk and stool sits to port allowing you to be able to work away from the office. 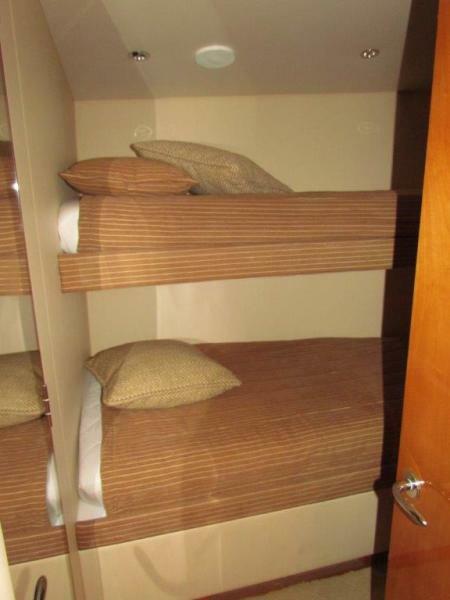 Guests can bunk in a VIP guest stateroom in the bow which features a queen walk around with cedar lined storage underneath or in the starboard and port guest staterooms, which includes side-by-side berths. 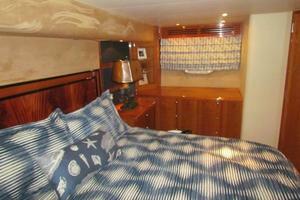 In 68 feet this is the only full beam master stateroom available in the market. 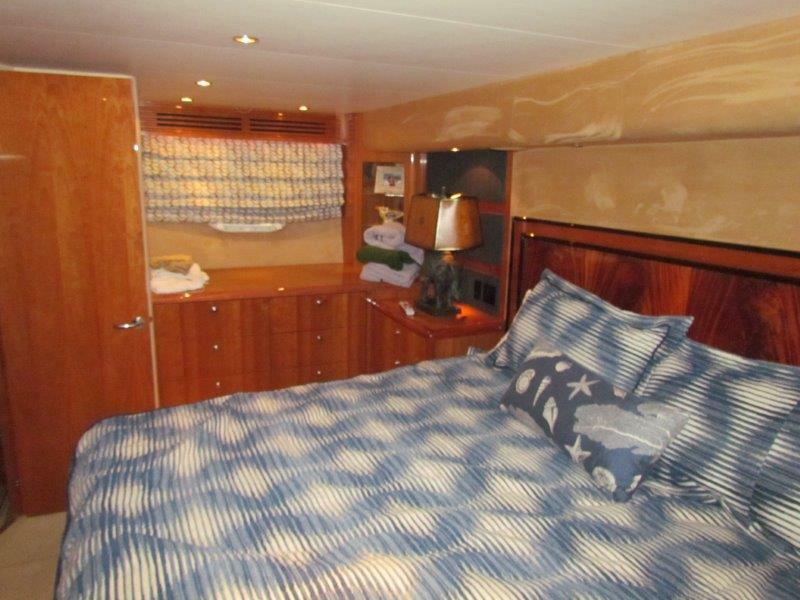 The 21'6" beam provides an expansive area featuring a king-size berth, twin nightstands, dressers to port and starboard and cedar lined hanging locker. 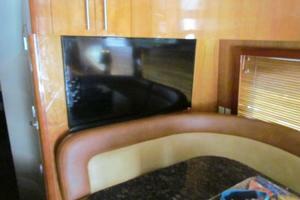 Relaxing is easy with a 20" LCD TV and surround sound system. 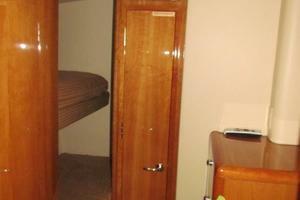 For lighting twin oversized portlights provide natural light into this stateroom. 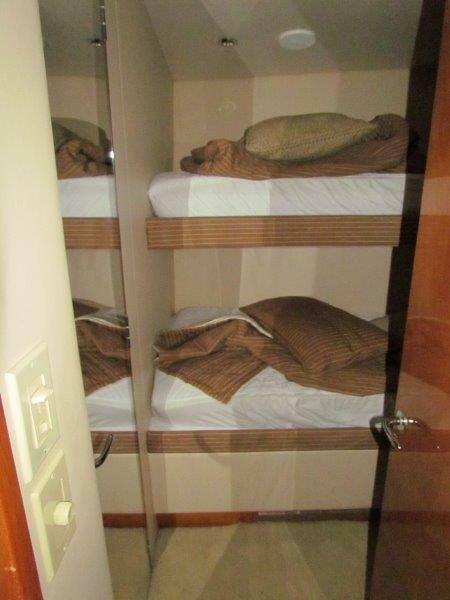 These guest staterooms, feature twin berths with storage underneath. 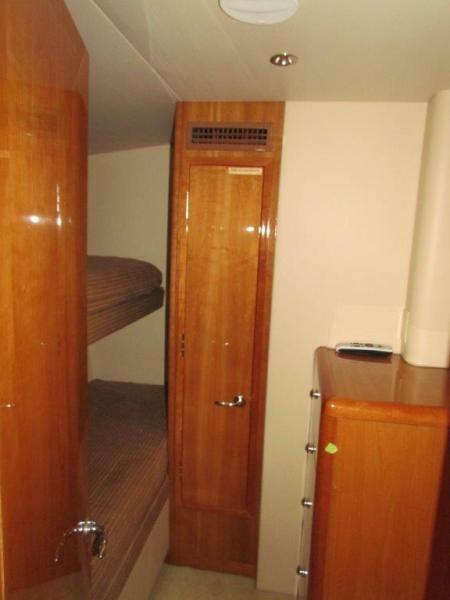 Most unique, is that you simply lift the nightstand and slide the inboard berth over to make a queen berth accommodation. 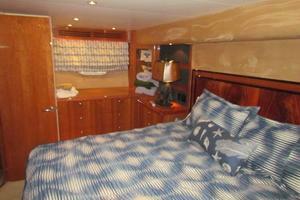 These stateroom offers tremendous storage with a cedar lined locker and hullside cabinetry outboard. 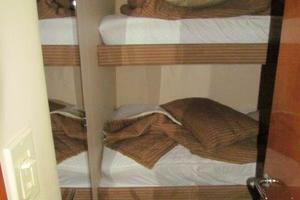 The Starboard stateroom has access to their own private head. 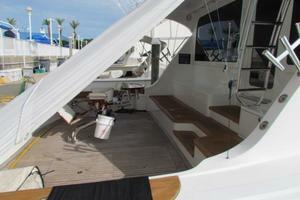 Venturing through to the companionway, you'll notice larger walk-ways than what you might see on other boats. 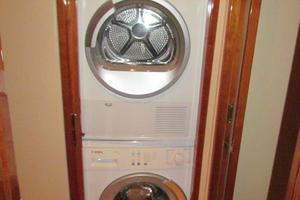 Walk in Laundry room with over under washer- dryer and hanging rod storage for eight 50 lb. 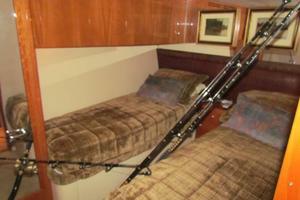 class rod and reels. 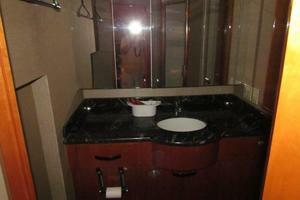 The master head provides granite countertops with undermount sink, with side and back splashes for easy clean-up. 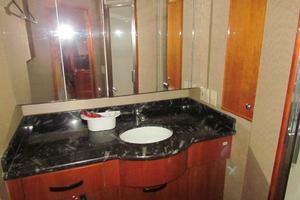 The vanity head cabinets are built with stylish bowed fronts and the cabinet bases are finished wood with flush doors. 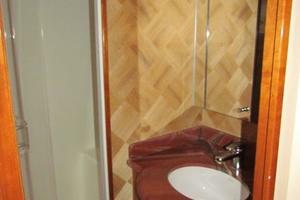 All shower doors have wood trim to protect the wallcovering as well as wood baseboards. Especially nice is the house style Headhunter superbowl toilet system which is a fresh water system and is quieter than the vacuum systems. 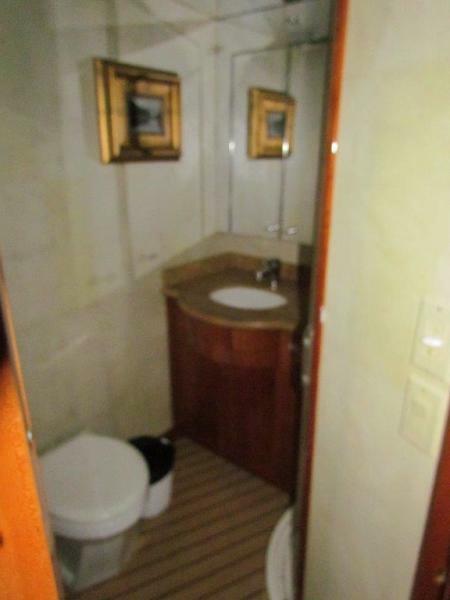 The day head serves as dual entry to the starboard stateroom. This head featuresstone counter tops with integrated sink, with side and back splashes for easy clean-up. The vanity head cabinet is built with stylish bowed fronts and the cabinet bases are finished wood with flush doors. 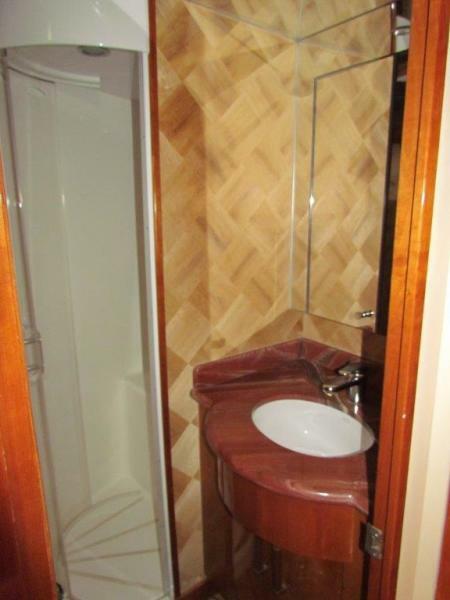 All shower doors have wood trim to protect the wall covering as well as wood baseboards. 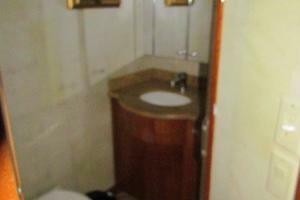 Especially nice is the house style Headhunter toilet system which is a fresh water system that is quieter than vacuum systems. 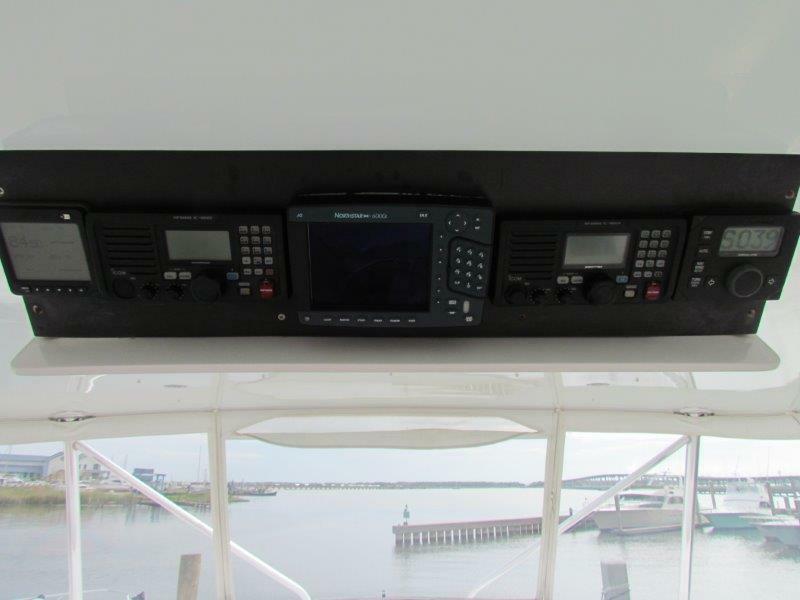 The open bridge offers wrap around seating forward of the console along with an 8-cubic foot deep freezer and insulated chill box. The extended overhang allows for twin helm chairs, with room for an optional third seat if desired. 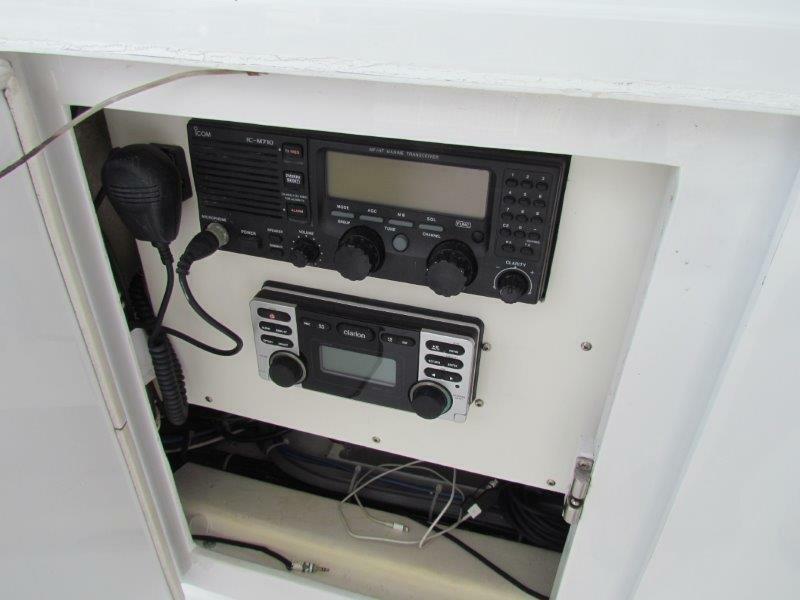 A rear facing jump seat provides quick access to the cockpit ladder, while the teak pod console and helm station provides generous accommodations for electronics in a power-actuated electronics console. 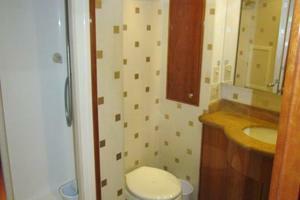 This particular boat has helm deck air conditioning for comfort while underway. A custom Pipewelders tower is built with a center line ladder for easy access. Mya- Epoch electric teaser reels recessed in Hard top. 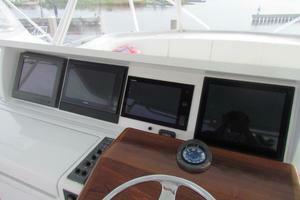 Hatteras is known for their attention to detail, and wiring is one of their strongest points. All wiring is tin-coated and sealed in an insulation jacket. Wiring harnesses are tie-wrapped every 6 inches and secured every 18 inches with easy access. 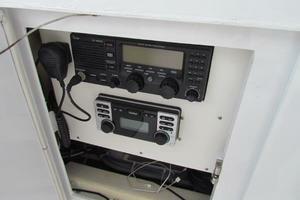 Wiring is color-coded and numbered at both terminal ends, and is well documented in the owner's manual. 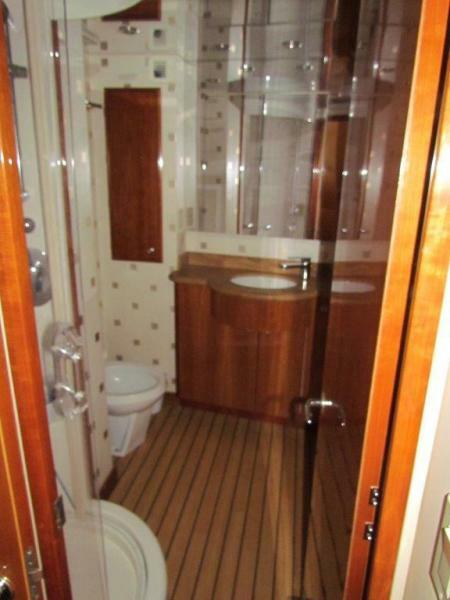 Go one step further to find their attention to detail in placement of dual light switches on both ends of the salon and companionway for convenience. 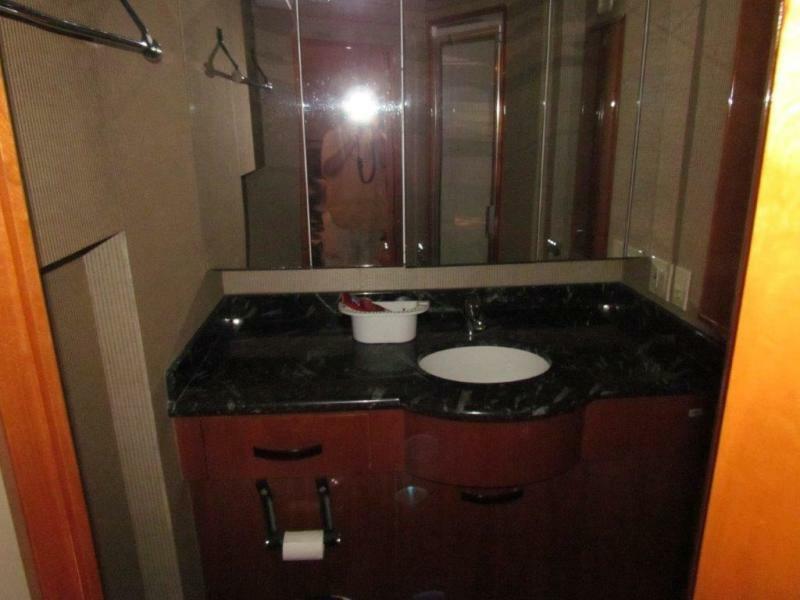 Something you'll miss on other boats. Computer controlled Ethernet monitoring system with LCD touch screen display providing visual and audible signals for engines, gears, generators, high bilge water, fire warning in engine compartment, fire extinguisher discharge in engine compartment, AC power loss, smoke detectors, all tank level indication, low battery voltage, alternator failure, battery charger failure, bilge pump control and run indication, holding tank pump control and run indication, and carbon monoxide detectors. A history log is maintained for critical alarms and trends may be set up to view various parameters with respect to time. 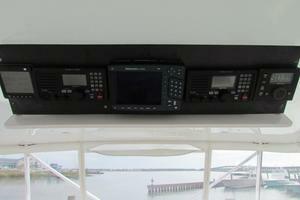 Additional monitoring points may be added to the system economically and easily. 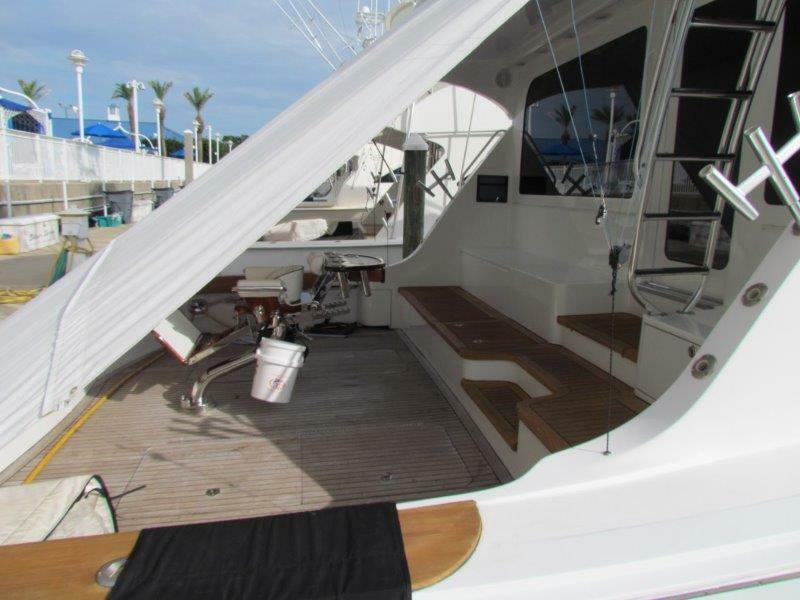 The engine room provides easy access to equipment and the bilges are painted with a high gloss urethane paint for ease of cleaning. 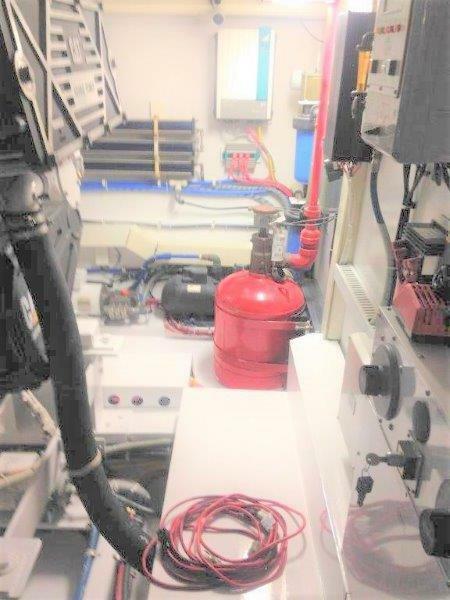 A forced air induction system draws cooling air for the engine room from underneath the cockpit gunwales, reducing saltwater intrusion into the engine room. Pressurized 230-volt AC freshwater pump with central charcoal freshwater filter and back-flush capabilities also back-up pump plumbed to system. 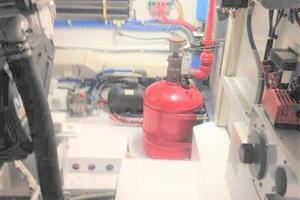 Air conditioning compressors and pumps with back up A/C raw water pump. The 192 square foot cockpit includes a mezzanine deck for superior seating and amenities. 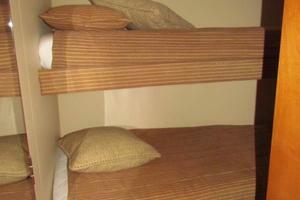 The mezzanine houses a 10-cubic-foot bait freezer with a single lid, in. 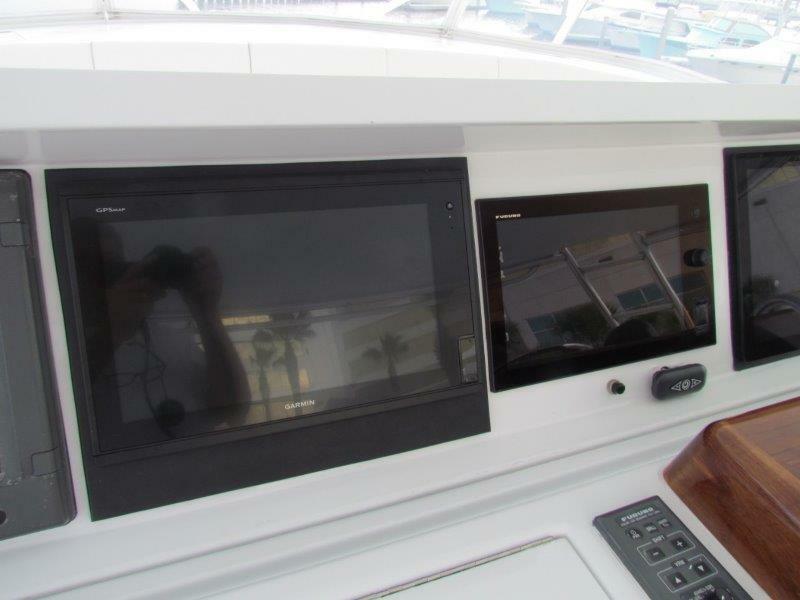 Two 65-inch fish boxes and are positioned in the cockpit sole. 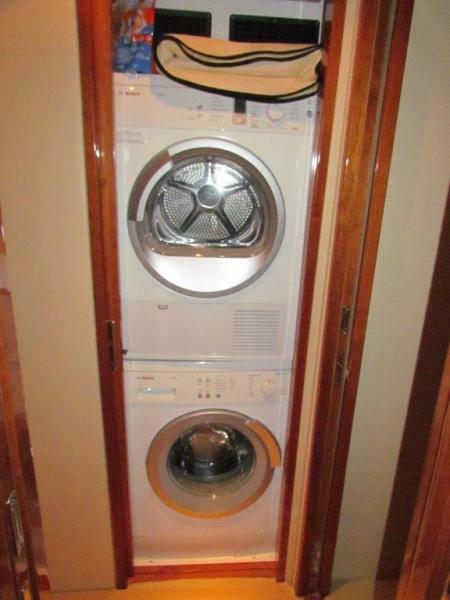 Twin 50 amp inlets and quick disconnects for fresh and saltwater wash-downs are hidden behind curved doors. In addition, beneath the step you'll find a refrigerated drink box and wet storage compartments, as well as two stainless tackle drawers. 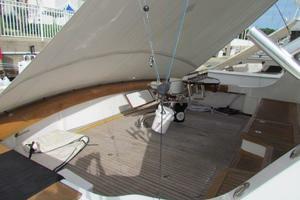 The cockpit offers a full teak package, teak cockpit sole, teak mezzanine, teak coaming board, curved, and covering boards and most importantly provides all of the fishing amenities. 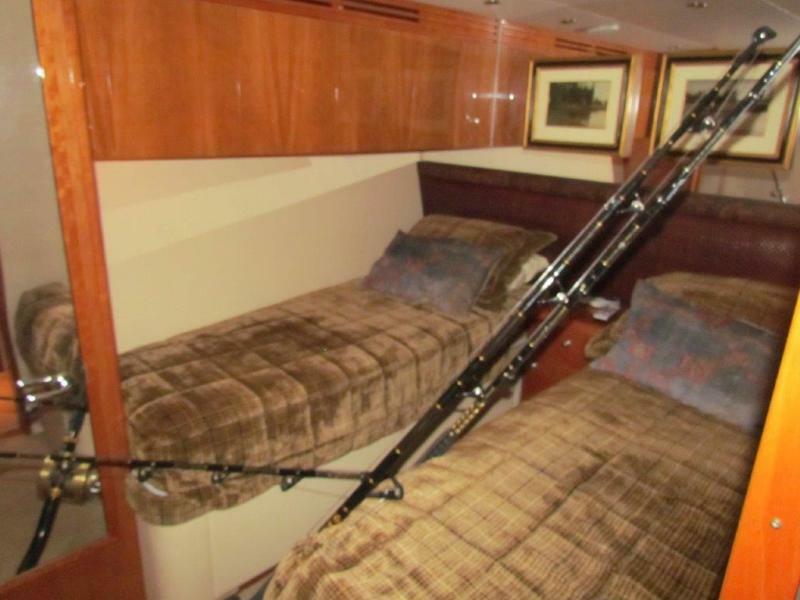 This boat is designed with longevity in mind as all stanchions and cleats are through bolted to aluminum backing plates that are encapsulated into solid fiberglass sections of the superstructure. Molded fiberglass UL approved tanks are placed between the stringers and glassed in place. All fuel tanks are constructed with a fire-retardant resin, and exposed surfaces are coated with a fire-retardant intumescent paint. 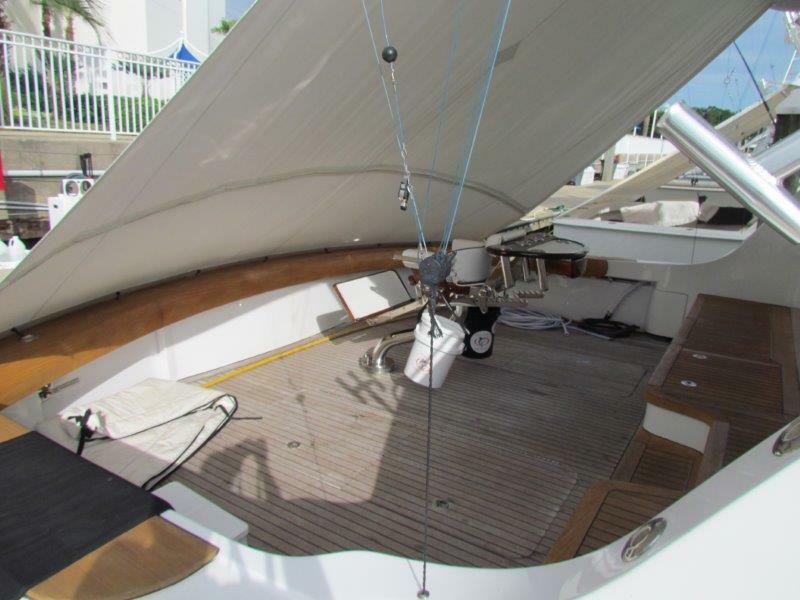 Bulkheads and stringers are fully tabbed into the hull itself and the stringer system is built of a closed cell polyurethane foam to provide forstiff longitudinal support with no fear of water intrusion. 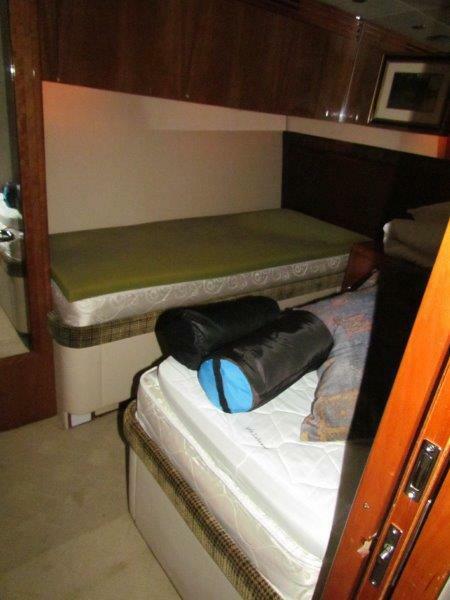 Attention to detail is evident in the many systems as you'll find rudder shelves made of pultruded fiberglass which is incredibility dense, strong and stiff material that will not corrode, rot, flex or break under strenuous use. 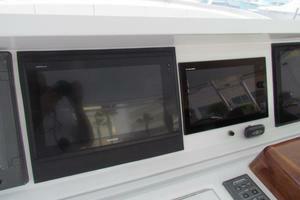 Simply look at the size of the running gear and pay special attention to the duplicated systems throughout the boat. 100' 3/4 chain / 300' 1" megabraid anchorline. 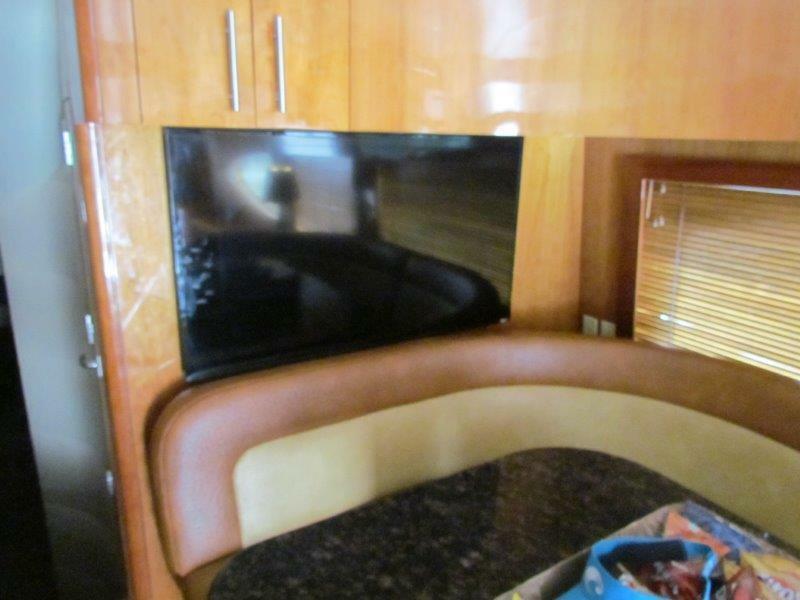 Just forward of the galley and dinette you'll find separate full size access doors leading to additional storage just under the brow of the boat. This particular vessel has an additional freezer.